If you're interested in good-time blues and ragtime music or are looking for a low-key group to practice your skills, join our jug band jam. Anyone can play or listen. 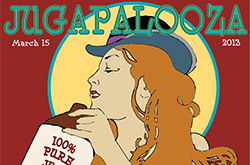 This annual showcase featured the best local jug bands, plus contests and events like a jug-off, a washboard whack-off and a fashion show. 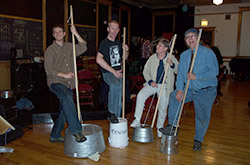 The fourth year was a jug band scramble and the fifth event featured dance lessons on dances mentioned in old songs. 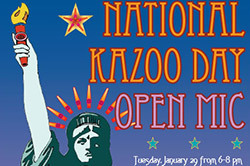 In honor of National Kazoo Day, this kazoo-themed open mic featured store-bought, homemade and vintage kazoos with solo performers, bands and a poetry reading. 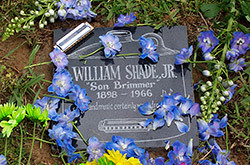 My first trip to Memphis took a somber turn when I found that my jug band hero, Will Shade, was buried in a pauper's cemetery. Inspired by an earlier effort for Gus Cannon, I located the exact grave location, then organized this benefit concert to buy a gravestone. 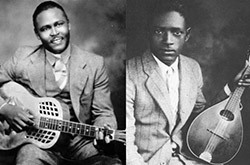 Check out the videos of performances by Charlie Musselwhite and the Carolina Chocolate Drops, or of the inspiring dedication ceremony in Memphis the following spring. Restvale Cemetery in Chicago is the famous burial location of Muddy Waters and Big Walter Horton, but two earlier blues pioneers were buried near each other in unmarked graves in a rear section. My second gravestone benefit concert was ambitious for the wider range of genres it spanned (the McCoys played blues, jazz and jug band music) and for the goal of buying two gravestones. 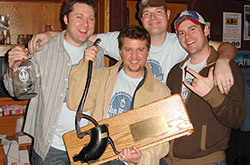 The Minneapolis Battle of the Jug Bands is such a thrilling event that it inspired me to try a similar event in Chicago. The first edition in 2008 was a blowout, and it's been going strong since then, with Skip Landt taking over in 2010.